Sardegna is a magical and mysterious land, I think of it as a place of beaches, crystal blue water, rocks, sun, sheep, silence, Vermentino, Cannonau and Pecorino,. What I didn’t know was that it also has the second largest cork factory in Europe after Amorim. I once interviewed the head of that Portuguese company but I have never had the opportunity to visit a factory until I visited one in Sardegna. Italy is one of the most important producers of cork in the world. Of the 2.2 million hectares of cork forests, some 225,000 of them are in Italy, 90% of which are in Sardegna and the other 10% in Sicily, Calabria, Lazio, Tuscany and Campagna. The wine industry is without a doubt the largest client of the cork industry and uses 70% of Italy’s total cork production. While some countries have completely adapted to alternative closures such as Austria and Australia even on premium wines, the more traditional markets such as Italy, France, Portugal and even to some extent, the United States, still feel that for a prestigious bottle of wine, you must have a cork. Despite the thousands of corks I have opened personally or seen opened, I never knew how many hands touched the cork before it went into a bottle or how much work it was to make quality corks. My visit to the Sugherificiomolinas in Calangianus will be the subject of my next post but for the moment, suffice it to say, my view of cork has changed for life. Every time I pull a cork now, I will see the faces of those working in the factory amid the smell of cork and the noise of the machines used to punch stoppers out of cork or to press the cork grains into flat panels to be used as construction materials. I will think of the trees I saw that looked like they had lost clothes, stripped from the trunk down. Of the objects whether it be wallets, notebooks, boards or insulation that are made from cork lots that have been personally tasted by a team of professionals using modern technology and optical sorters and well as the human eye. Before a new cork forest is mature, 20-25 years must go by. 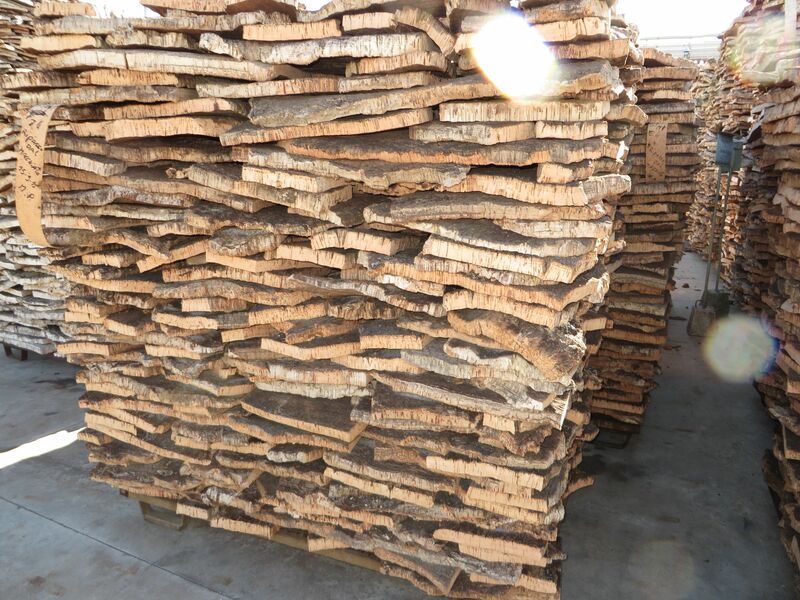 Cork trees can live to be 150 years old but they can only be harvested every ten to twelve years in Sardegna. 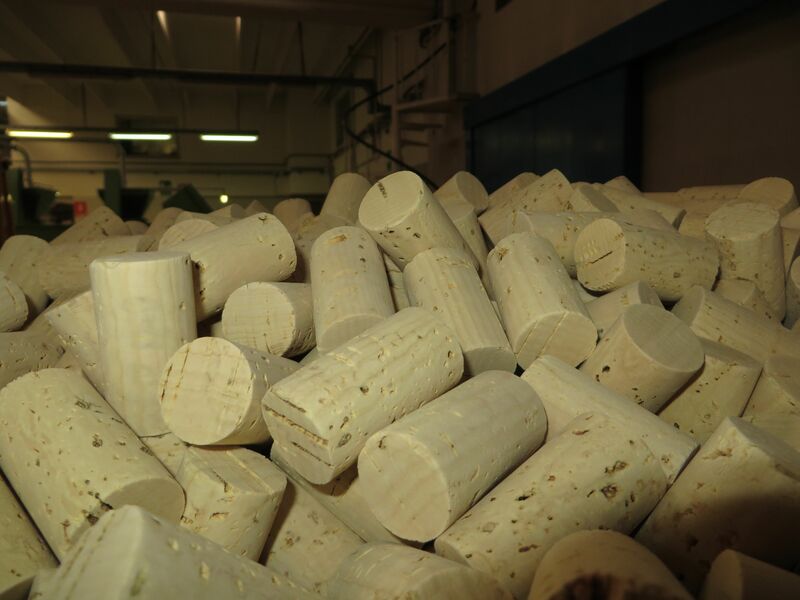 As if that weren’t enough to make cork a prestigious item, in order to be a good quality cork, the third harvest yields corks that are considered to be of the right quality to be used with any prestigious wine. The cork industry is therefore one that calls for patience, longevity in terms of your outlook and time. I’ll write more on this visit in the next post.